Travelling in the Footsteps - debut studio album, released in September 2018. 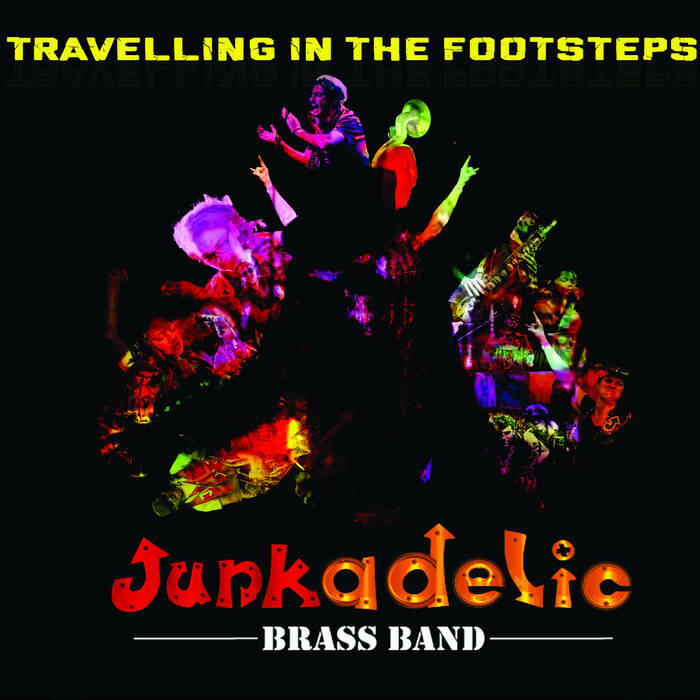 Junkadelic Brass Band is a strange band for a number of reasons, but the first, most obvious reason, is the instruments. We play buckets. Loudly and proudly. It's a strange band because it's been together for 16 years and only now recorded a full album. It's a strange band because we're just as likely to be playing a late-night pub gig, as dressed as dystopian cyborgs in a street parade. It's a strange band because from its protest street-band wheelie-bin bashing origins, the music we make now has evolved into something very different, very special and uniquely our own. The sound comes from using what we have: junk percussion, the synergy of a family of musicians and great writing. whilst always drawing from our musical upbringings. You're now holding a fleeting culmination in that evolution. Travelling in the Footsteps is a collection of select bangers from the last five years. We'd like to thank everyone in the Junkadelic-massive extended family who've been involved in this project from the very beginning, to all those who keep coming back to the gigs and to you, who have acquired this album and maybe checking us out for the first time. This metric handful of tunes represents an awesome ride and now we look forward to marching forward on our strange musical journey, deep in the footsteps of those who've come before.